I’ve put off writing any kind of long fiction for almost my entire life. The vast majority of the writing I do is journaling, essays or poetry. I love science fiction literature, but the idea of sitting down and writing a book always seemed so daunting. I’d try, then make it a third of the way through and get lost. It would languish for so long that by the time I went back it I wanted to scrap the entire thing. 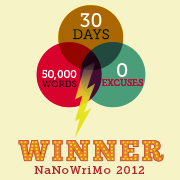 On a whim and looking for a distraction the week after my mother-in-law died, I decided to try my hand at National Novel Writing Month (NaNoWriMo). If you enjoy writing in any sense and haven’t given the challenge a shot, I highly encourage you to do so. It forced me to sit down and just write every day in November. It didn’t matter if what I put down was a complete wreck or created a massive plot hole, the challenge made me think creatively and problem solve every day until I hit that 50,000 word mark. I never thought I’d actually finish it and there’s a massive amount of editing to do to make it anything I’d want to share, but I wrote a manuscript for a novel in a month. It’s honest and it’s mine. Aside from the nice feeling of accomplishment, there was also something very cathartic about the experience. I’ve always seen writing as therapeutic, but I didn’t think that fiction would have quite the same feel to it. Interestingly enough, the idea that I could write anything or create a character as wonderful, horrific, or just plain crazy as I felt like was liberating. In a way it made me work through my own daily thoughts and feelings in a constructive way. I appreciate writing for the positive way it has enriched my life and made me a more creative thinker. November also brought with it a strong compulsion to purge the house. I don’t know why, but I’m really glad it did. It made me get around to going through the old computer equipment, files, random junk, kitchen toys, clothes, and general nonsense that accumulates when you are too busy and tired to care about it. We were able to recycle or give away a lot of things and the process reminded me to be grateful to have so much and to see cleaning out the house not as a chore, but as a way to share. I appreciate cleaning for making me remember to be a mindful citizen of the planet socially and environmentally. Along with said compulsion to act as a tornado around the house came finding all sorts of hidden treasures! Among the items I found was a single, lonely CD labeled only as “Back up 9/04.” Buried in a storage tub full of my old journals and some paper files, It was scratched to death and I was sure that there was no way my laptop would read it. When I put it in the drive, the loud buzzing as it began to spin was less than encouraging. But the Auto Play dialog box popped up and I clicked the button to open the files. Before me was my entire freshman year of college on one, sole disc. Between five moves and several computers I thought I’d lost those files (I have since become more diligent about having redundant back-up copies). There was a folder full of poetry, one of school work, and one of music compositions. But it was the last folder on the disc that caught my eye the most: It was just labeled “hub” and I knew exactly what was in it. My freshman year of college was chock full of luck. 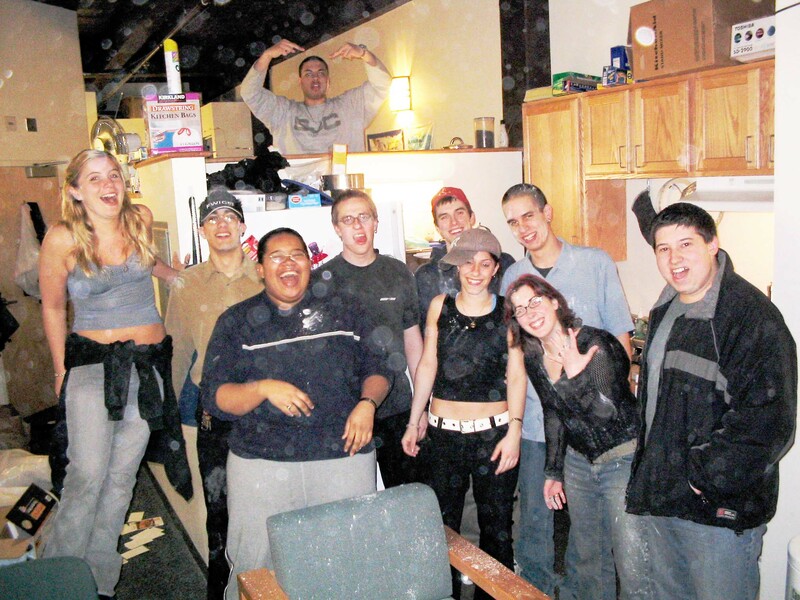 I was a depressed mess of an individual when I left Pittsburgh and somehow ended up in a small dorm where we were practically a family and in a major where I don’t think there was anyone that didn’t like each other (even though we were almost always competing with one another for stage roles). Then there was The Hub. A few of the computer science majors ran a file sharing hub that was open to anyone with an on campus IP. It also had a chat room and that is where I started talking to a bunch of people in entirely different majors (I’d later marry one of them!) and “met” many of my very best friends. We’d spend a few hours, usually obscenely late at night, just typing to each other and making silly, sarcastic jokes. It should have been the most awkward thing in the world when we all finally decided to meet in person, but it wasn’t, aside from the fact that none of us knew each others’ names at first. And after that one night meeting up and walking to the only open place we could knew of—a pizza joint called Little Steve’s—at 3 in the morning, we were a regular Island of Misfit Toys in the very best sense. 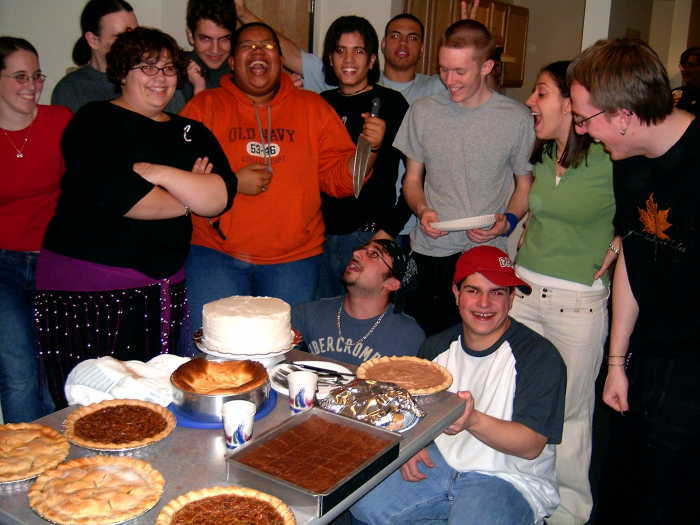 So when I found that folder a few nights ago, full of pictures from our weekly dinners and chat logs from our funniest conversations, I was reminded of how much that group of people completely changed my perspective on what it meant to be a friend. There are only a few of them that I keep in touch with, but they will always be with me. They changed my entire life for the better. They brought me joy when I didn’t believe that I deserved it, and put me on their shoulders while I found self-confidence. Even at my saddest moments, I think of them and think “Bring joy.” If I can find at least one moment each day when I make someone smile or laugh, then that day is a success. I appreciate the whole hub (especially three Joes, two Ians, Kris, Johnna, Anthony, Evan, Talia, Brandon, Mike, Colin, Mark, Ed, and Kevin) for teaching me how to just let go and LAUGH. No, she didn’t maim him. She’s probably the one person in our dorm I trusted with a chef’s knife. While this post might not contain delicious food (aside from that table full of Kris’ baking magic), it is one of the most satisfying things I’ve made recently. But just so you don’t feel neglected: Our office’s annual recycled arts and crafts show and reception is coming up and I am the chef de cuisine for the evening. Which means an incoming Recipe Megapost! Look out for it late next week. For now, I leave you with this: If the holiday shopping is already driving you toward the bourbon-laced eggnog and spiked mulled cider, remember that what you carry with you in the spiritual sense is the one thing that you’ll always have. So let it be joy.